You probably want to reduce your cooking time as much as possible when you are camping. You’re here to have fun and that means less time spent on meal prep. Fortunately there are plenty of things you can make ahead of time and bring to the campground that will make cooking much simpler. 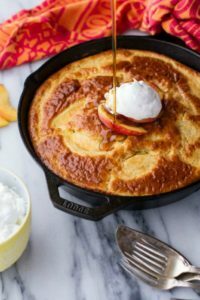 Peach Breakfast Bake – You’ll cook this in a skillet and you’ll need some fresh peach slices and a batter. Make it at home and freeze it right in the pan. Then you drop it on the fire and a short time later the whole family will be happily enjoying this delicious meal. Lemon Chicken and Potatoes in Foil – This is one of the best chicken meals you’ll have. Grab some baby red potatoes, chicken breasts, Dijon mustard, lemon and herbs. You’ll wrap it all up individually in foil packs. Everyone gets their own and you won’t hear a single complaint. Breakfast Burritos – You’ll scramble the eggs with a dash of taco seasoning, add some hash browns, and the meat of your choice, go for it with cheese and green chili. Wrap them up and toss them in the freezer. They’ll be ready when you are. We hope these give you a head start on your make-ahead meals endeavor. You can find the recipes for these and more at 11 Make-Ahead Camping Recipes for Easy Meal Planning. We look forward to seeing you spend more time playing and less time cooking.